We have carried out various painting and decorating contracts for Nottingham Trams Limited around the Nottinghamshire region and on an ongoing basis to refresh their colour schemes at various Tram Stops, Depots and offices. We also completely re-decorated the internal offices and circulation areas at the Depot - colour schemes to match the corporate colours required. We have also completed several external projects at various Hubs/Trams Stops at Cinderhill, Basford, The Forest Recreation Ground, and Moor Bridge - all of which have included re-painting all the handrails, railings and display posts/signposts - all completed with high quality metal finishing paints in the corporate colour scheme required. The recent extension of the tram service to link in with Nottingham Station, also required us to complete the stairwell refurbishment (which links the tram service to the train station). The stairwell was showing signs of some corrosion to the treads and joints, where water had leaked through. 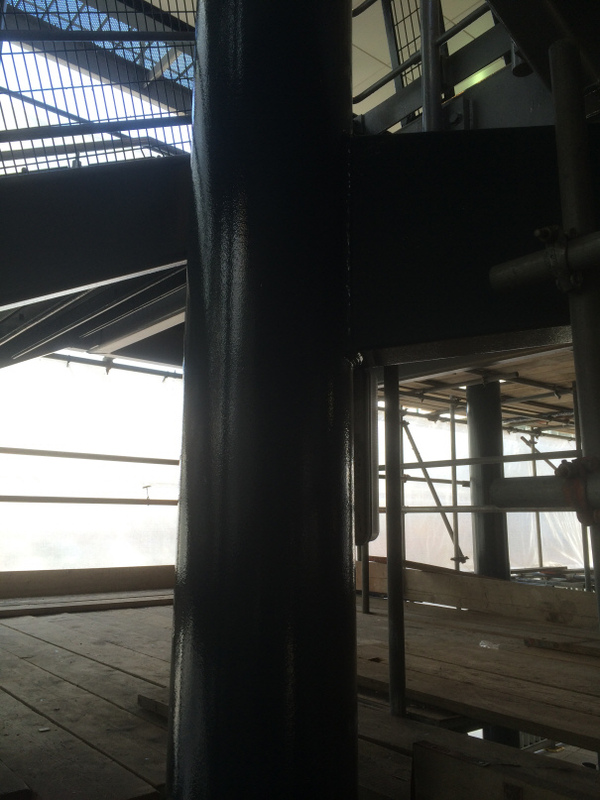 Our project included for the full scaffold of the stairwell, chemically cleaning the metalwork to remove any grease and gum and grit blasting back to remove loose coatings and provide a sound base for re-painting. The surfaces were then coated with Epoxy primers, undercoat and finishing coat - supplied by Dacrylate Paints, Sutton in Ashfield.